The video shows the unusual driving manoeuvres of this wheel chair. Quite simple forward or backward is sure also possible. 178 HP from the 2.2 HDI engine have to deal with only 800 kg racing car. The design study Karo to the 25 cars in the RC series was shown on the Genevan motor show in 2002. One of 25 racers in the RC cup is used from Peugeot Germany and Total Germany. Driver is Patrick Hang from the promising corps of the magazine 'Auto Motor und Sport'. Very spartan it in the Cockpit of the Peugeot RC cup biodiesel racing cars. The steering wheel is removable to the lighter entrance. Already so about 20 m farther in the exhibition hall I noticed the kart presentation only by the noises while crossing ofver wooden plates sunk in the ground. There are electric Loisika kart races also on icebound lakes. For of such type wintry racing distances these speik tyres are intended. Sample suitcase for the different dimensions of lithium polymer batteries. Typically for the Kokam batteries is the flat design in opposit to the to the usually cylindrical shaped batteries. The biggest one of the flat batteries cells has 200 Ah. 100 pieces of it would even give a 3.5 tons truck a convincing road performance. The size of the engine in a serial hybrid vehicle is substantially smaller than in a conventional car. Therefor is 15 kW enough for small cars and lower middle class. 23 kW could be the drive resistance of an optimized Hybrid minivan with 130 km/h. Because of the batteries the generator must cover only the average power demand. Quite differently than expected reacts the wheel chair with a pressure to the left. No left turn, but the chair goes to the left. For a left turn forwards press and turn. The secret of the unbelievable agility of this wheel chair as for example parallel movement and turns right on the spot are the rollers mounted on the wheels. All 4 wheels of the wheel chair have an own electric motor. Besides, forward and backward the steering system let the rollers rotate free or blocks them. 2 sealed lead acid battereies with 12V 25Ah are enough for one day driving. 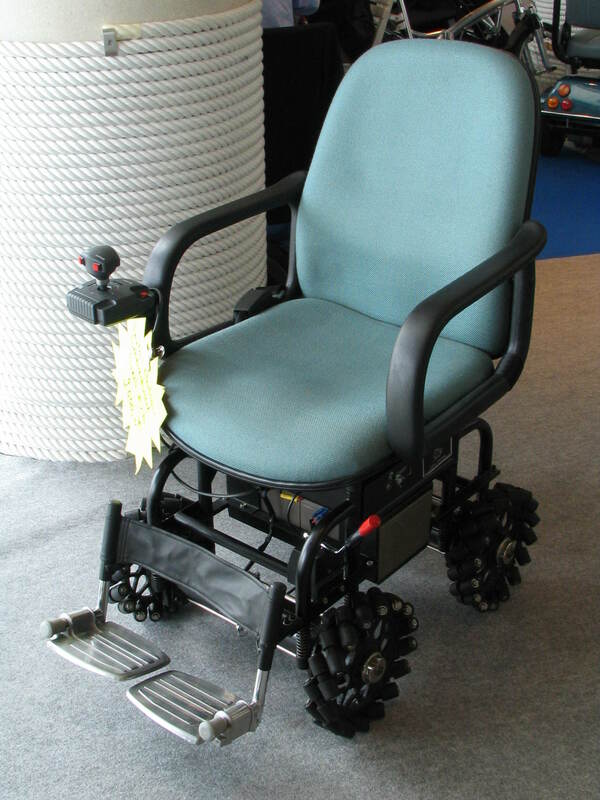 Motorized chair for disabled persons, which can go short distances still by them self. Regretfully, old Peugeot 106 was the only full electric car with 5 seats on the fair. Two-seaters or Golf cars similar open constructions do not count there. While there was nothing to replace an Peugeot 106, there had been 3 companies with 5 different offers to replace 50ccm scooters by electric versions.